Do you wish your home could be a “good neighbor” to its surrounding and be self-sustaining (and wouldn’t cost an arm and leg to heat and cool)? A sustainable home was an important value to Jeff and Sandy. Towards that end the couple specifically sought out a home builder known for building high-efficiency homes (in this case Nick Lehto). They chose to build double stud 12” thick walls with dense cellular foam to get to an R45 insulation value. 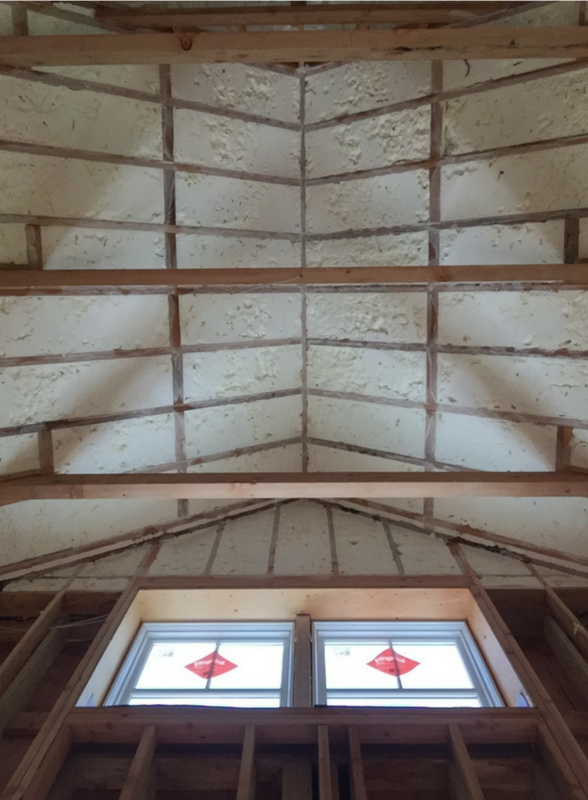 Since this home used a streamlined roofline design insulation was put at the roof (in this case a 2″ closed cell spray and 15″ of an open cell foam). They used a silver-gray metal roof which has properties to bounce the heat away in the summer and because it’s durable, low maintenance and energy efficient. They also selected a geothermal heat pump system which takes energy from wells and transfers it inside. In this home Sandy and Jeff don’t need to worry about getting $1,000 heating bills in the winter like they did with their old home (they have a net zero energy cost home! How cool is that?). 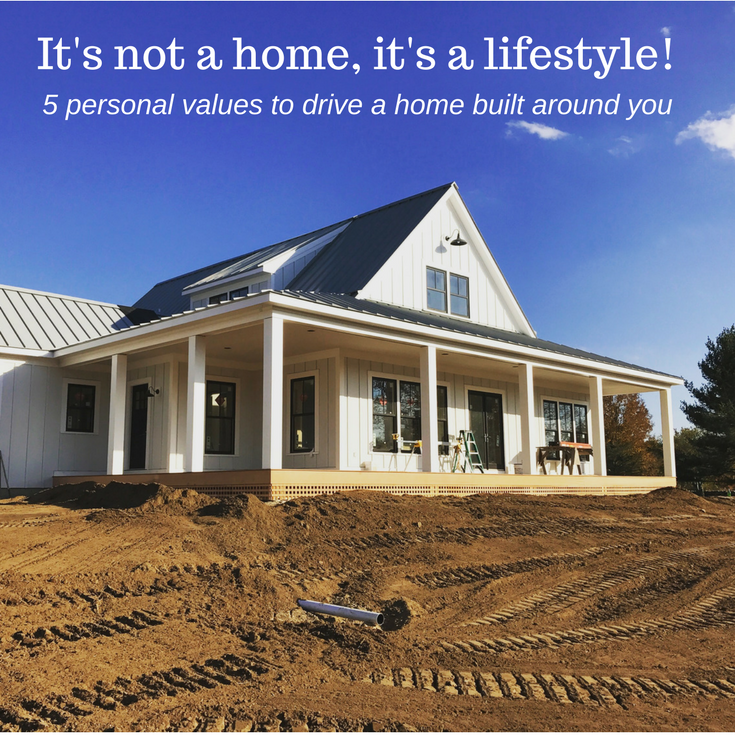 Why build a home if it doesn’t serve as a place to connect with family? This home was designed around entertaining, family time and to promote an un-plugged lifestyle. The epicenter of the home is a central kitchen, dining and great room area perfect for family gatherings and of course, meals. 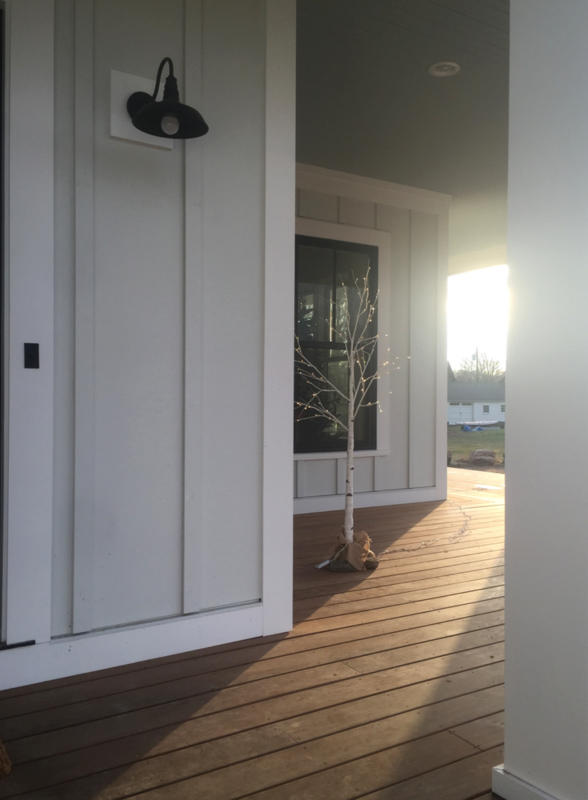 Off the back is a 600-square foot screened in porch to enjoy quiet evenings at home – without worrying about getting bitten by pesky bugs. Outside they planted a vegetable garden. They even get Brody out there to “till the land.” He made sure they planted peppers so he could enjoy one of his favorite foods – salsa! Brody also enjoys the fun wrap around porch in the front. I don’t know if you’re like me but if I wish I could eliminate the north elevation (i.e. the darkest side) of my home. I love sunshine and plenty of it! If I could get rid of all the blinds and curtains in our house I would (although then I might get arrested). I guess in this way I’m like the Alexanders – who sought to draw in light from all angles. A light filled home is not only bright and cheery, it also cuts down on the use of electricity to light rooms. With the goal to have a light-filled interior (unlike their previous home which was densely wooded and dark) this home was positioned to face the south side of the property to take advantage of passive solar heat gain – and most importantly, because it maximizes natural light. 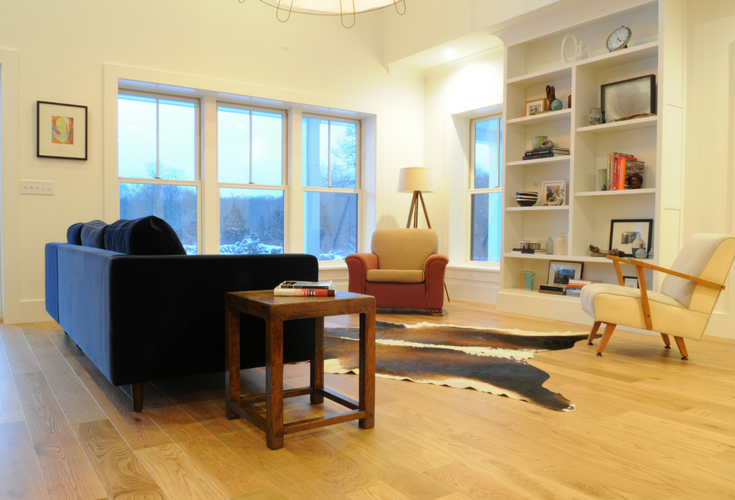 To play off the traditional modern farmhouse theme double hung windows were used and dormers added to capture light from all sides for Sandy’s lofted studio home office. With all the emphasis put on natural light the couple still faced a lighting challenge. The center-point of the home was the kitchen. it had less natural light (since there was a lofted room above the screened porch on one side of the kitchen). Jeff and Sandy would need an inventive way to move light from one floor level to another. 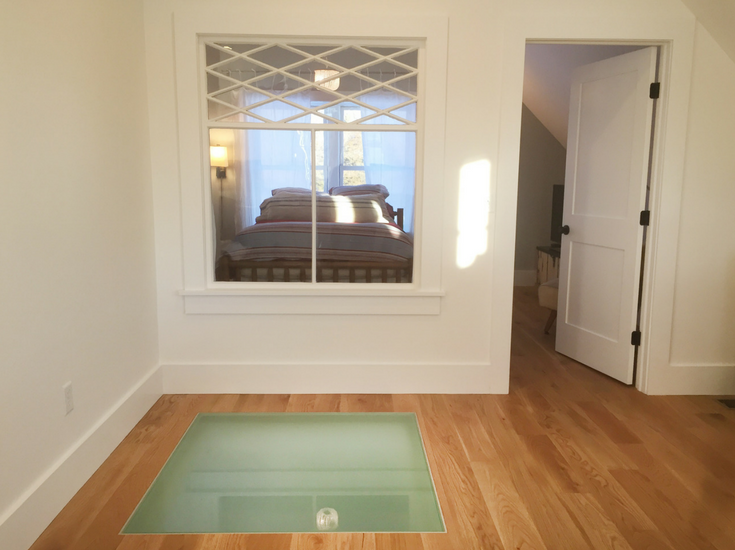 The ingenious solution was to install an obscure glass floor between the lofted studio office above and the kitchen below. In this way, natural light flows from the studio during the day into the kitchen below. If you look in the ceiling you’ll see the glass floor panel from the lofted studio above. It moves light into the space day and night. One other unexpected benefit is during the evening lighting from overhead fixtures and lamps in the home office bring soft ambient light to the kitchen below. The use of this glass flooring system improves lighting day and in the night. I guess it’s BOGO lighting special! • Choose a standard house plan and modify to your tastes – The couple combed through home plans looking for one which covered most of the bases and then hired an architect to change it to fit their needs. 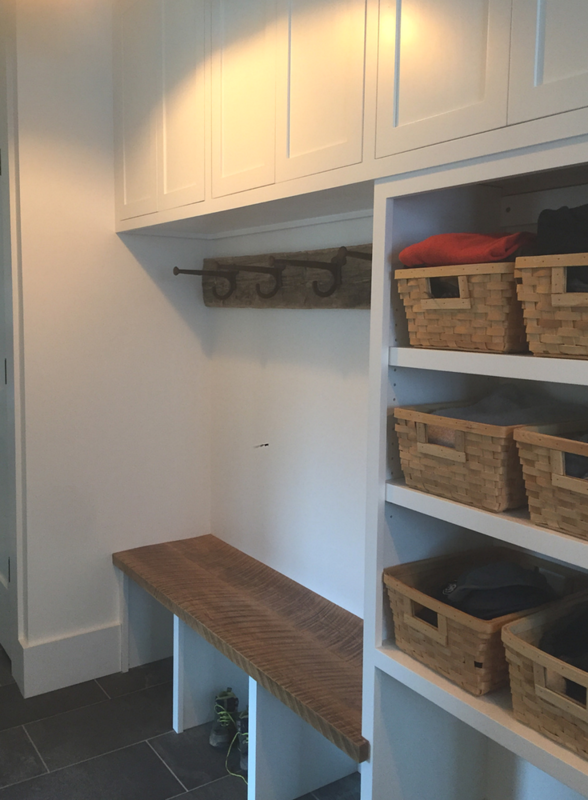 This local architect modified the original design eliminating the fireplace (so the home would be tighter and more sustainable in conjunction with their goals in value 1), added a mudroom and pantry, and one large family area in the kitchen/dining/great room. 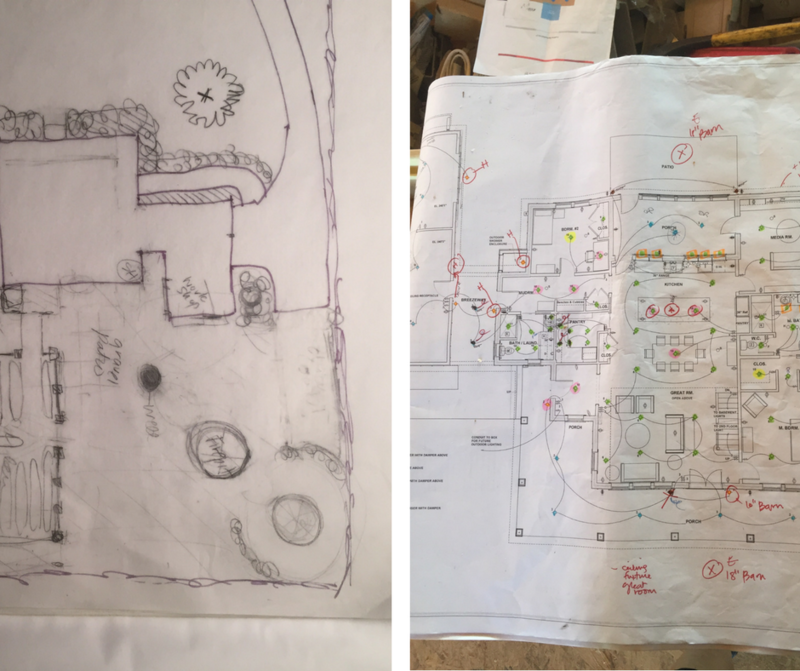 There is nothing wrong with hand-drawn sketches (or the back of an envelop) to get to the perfect custom home for you! 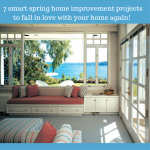 • Add personal elbow grease – While custom home builders and suppliers can be excellent, they often lack time to aggressively look for deals for the owners they build for. 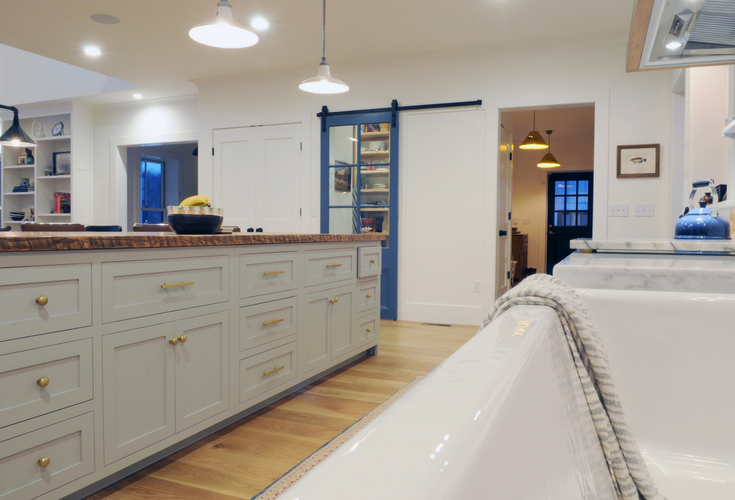 Sandy served as the co-general contractor on the project (this works well because she is also a design professional through her company Dessa Lea Productions). She worked to find better prices, while maintaining the spirit and quality of the original design. • Embrace salvage finds – Every woman loves a deal (I’m sure my wife Rose would agree with this). Sandy sought out unique salvage pieces to add character and keep costs down. She located reclaimed barn wood for the shelving in her pantry. She used a piece of red oak which as the top of the pantry island. 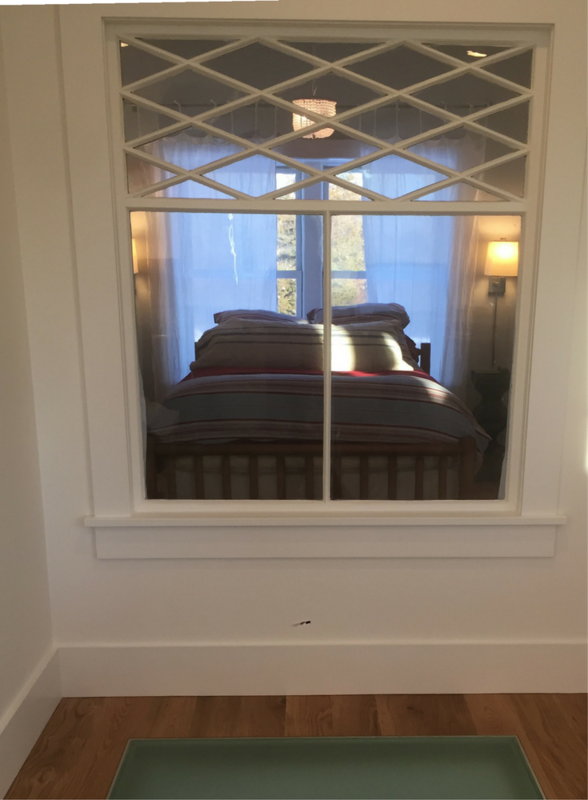 An ornate window in a guest room offers a fun way to move passive light into the home studio (which is then radiates down towards the kitchen through the glass floor panels). 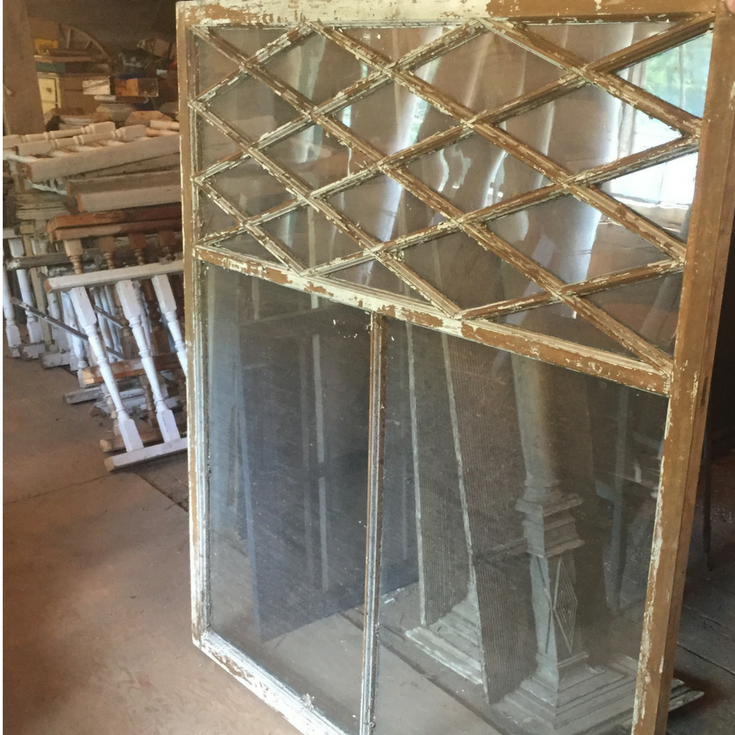 See below how this salvage window was transformed in the building process. You and I are not made to live alone. We are made to live in harmony with neighbors and enjoy a connectedness to others. Where we live can be designed to breed connection, or cut us off from the world. Sandy and Jeff desired connectedness. Towards this end the home is equipped with a welcoming 600-square foot wrap around front porch. In the building process Sandy also put on emphasis on the local community to buy her products. Doing business with local suppliers can be smart economically and better for the overall carbon footprint. 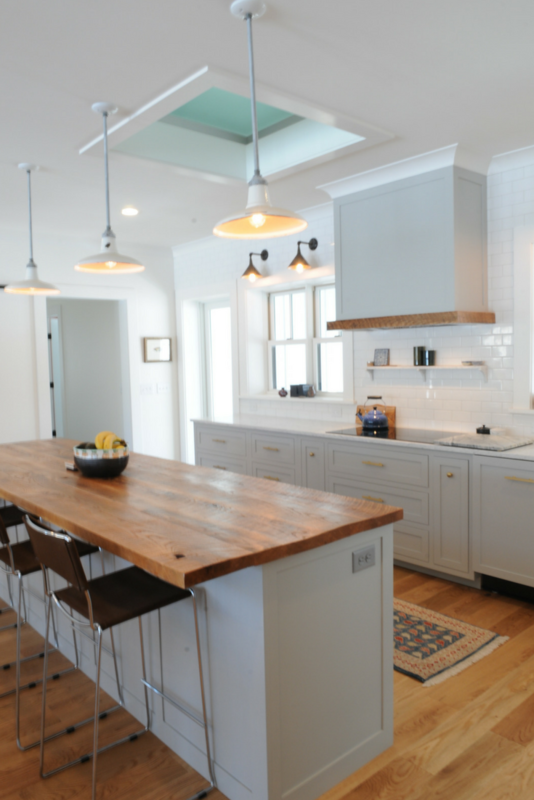 She chose reclaimed materials, cabinetry, and woodwork from her future neighbors in southeast Connecticut. As Luther Vandross would sing if he was alive today, “A house is not a home if there is not someone there to hold you tight.” Building a home (in my humble opinion) should not just be about a bunch of sticks and bricks. A home should be a place to enjoy those who you want to hold tight. It should be an environment which respects the precious natural resources we enjoy during our time on this planet. It shouldn’t be a pain to maintain or cost you an arm or leg to own. In addition – it doesn’t hurt at all if it’s flat out beautiful! I love the inspirational example provided by Sandy and Jeff’s home. It shows a house really does become a home when you care about its design, your world and the people who are going to live in it. Building a home like Sandy and Jeff’s does take a village. It’s not one person who will make a family-friendly, budget conscious, cool looking place like this. I have listed here some of the key people and companies (my own included – we were fortunate to supply the glass flooring for the project) who can help you. 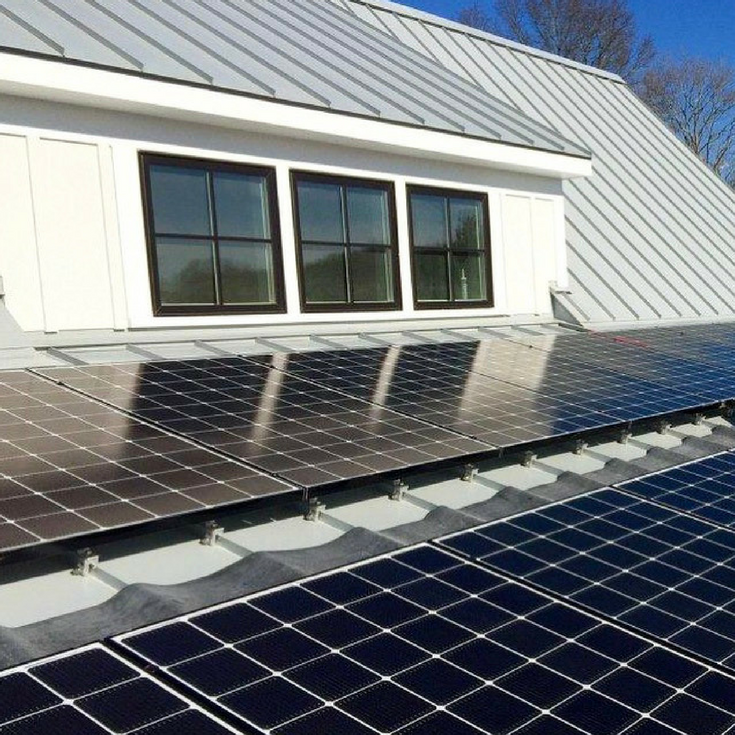 • For a Connecticut custom energy efficient home call Nick Lehto of Lehto Design Built at 860-481-5497. • For nationwide supply of a glass floor, glass bridge or stairs call me at Innovate Building Solutions at 877-668-5888.